Did you see the Fully Loaded Nacho Fries I posted on Sunday? It seems you guys just can’t get enough of them and I don’t blame you! I’ve been thinking about them ever since! 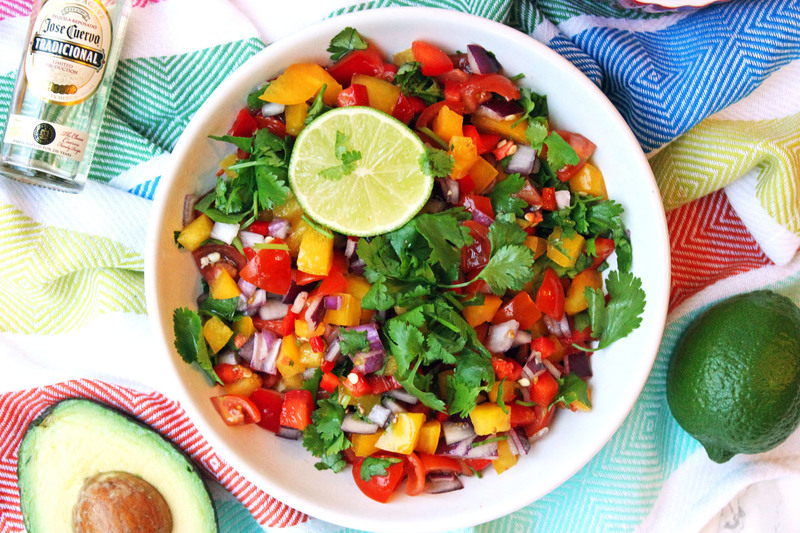 This Tequila Salsa was piled high on top of them and I’m sharing the recipe with you today. Tex-Mex food is high up on my list of things I couldn’t live without. Indian and Chinese food would be pretty high up there too, (the list may or may not be exclusively food and drink related…) but Tex-Mex / Mexican is one of my favourite cuisines. When done well, every mouthful feels like a fiesta full of loud music, raucous dancing and happiness! Just looking at a big bowl of this salsa you’ll see bright yellows, greens, reds, oranges, even purple from the onion. The flavours are both sweet and spicy. But with this recipe, what you don’t see, is the smokey heat of tequila! You can’t think of Mexico without thinking of tequila – this is one salsa that is NOT for kids. Tequila is distilled from roasted agave hearts. When they are roasted the starches in the plants are turned into sugars which become the distinctive alcohol. A good aged tequila sometimes called dark tequila or gold tequila has been barrel aged. Often in old American whisky barrels. This gives it a characteristic smokey flavour which is perfect for the tequila. If you can only get your hands on white or silver tequila, it’s not the end of the world but I’d hold back a splash or two or it might be too harsh. Now the normal way in which I consume tequila is out of a tiny glass cup, with salt on my hand and a wedge of lime in the other. With that in mind there is a healthy pinch of salt in this recipe and a good squeeze or two of lime for good measure! Remember when I said that Tex-Mex food tasted like there was a party in my mouth! 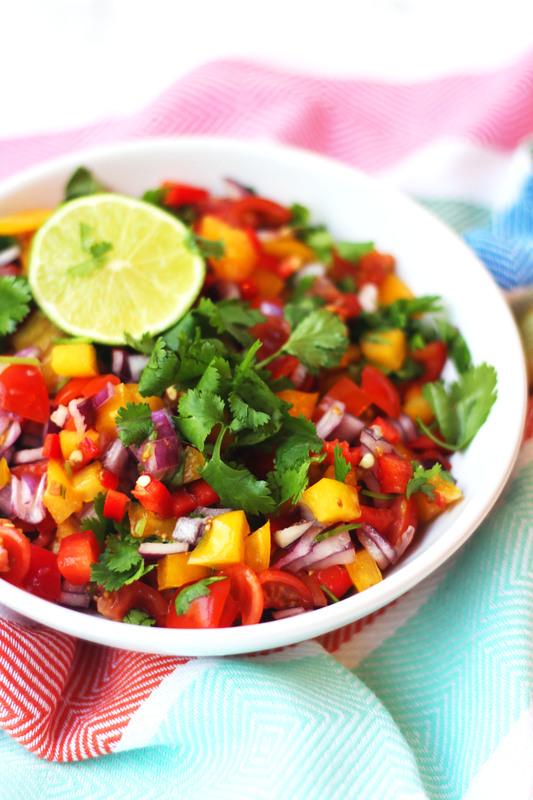 With this tequila salsa the party is just getting started! Finely dice the tomatoes, peppers, chilli and red onion. Add the pinch of salt, lime juice and tequila and stir well. Leave the salsa to sit for 30 minutes for optimum flavour. Roughly chop the coriander and stir through the salsa immediately before serving. This salsa would make a great addition to any taco bar but goes particularly well with rich and smokey beef barbacoa and these black bean tacos. Slow cooked black bean tacos! 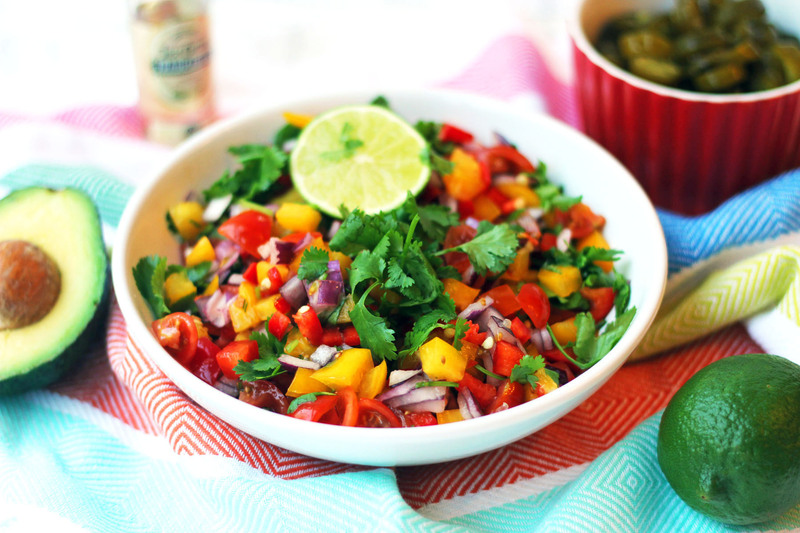 If you like this tequila salsa recipe then why not try one of these recipes from some of the best food bloggers in the UK! If you like this recipe, do make sure you pin it for later! You never know when your next Mexican night is on the cards. How beautiful! My hubby loves anything with heat in it, so this will definitely go on the ‘to make’ list! Thanks! My pleasure Judy 😀 hope your hubby loves it! OMG!! I love this idea!! lol It’s such a beautiful and colorful salsa!!! Cheers!! Sounds like great grown-up party food! Thanks Mary 😀 that it is! So we have some friends coming to stay this weekend, which means loads of drink and meat. This salse will go awesomely with the meat. I never would have thought to add tequila to salsa but it is genius. Pair this salsa with some margaritas and call it a party. Oooooh can I come 😀 sounds like a plan! Oh my goodness. I think you might just be a genius. Why has it never occurred to me to add alcohol to salsa?! Gorgeous! Thanks Becca. One of my aims in life is to put more alcohol into more foods hahaha! Did you add tequila to the salsa? I NEED to try this! I certainly did Diana. It’s AWESOME! A boozy salsa! Love it! I think that the addition of radishes for crunch and brightness is brilliant. Taco bars are a frequent thing at my house, and I can’t wait to add this to the selection!